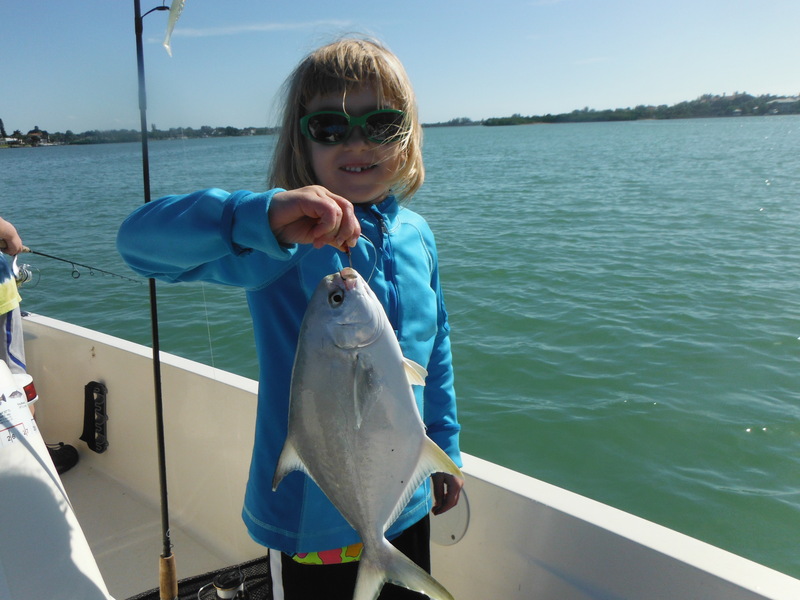 January fishing in Sarasota is all about the weather, pure and simple. Angling success is determined by the ability to adapt to the existing weather conditions. Tides will oft en times be very low in the morning. Couple that with a northeast wind and the flats will not have very much water on them. Water temperatures will be at their annual low. It is time to change tactics! I spend a lot of my time fishing the area around Siesta Key in the winter. Both passes and the surrounding flats will be productive under ideal conditions. Weekly fronts will stir up the Gulf, bringing cold, dirty water in through the passes and up onto the nearby flats. However, the area down south stays protected, and this will result in better fishing. Extreme low tides will force the fish off of the flats and into the channel. This actually makes locating them easier. 1/4 ounce Cotee jigs in olive and rootbeer/gold are very productive, as is a shrimp free lined with a small split shot. 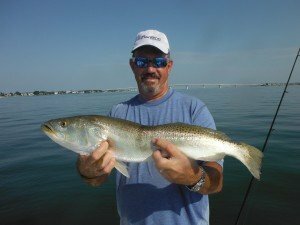 Speckled trout, ladyfish, jack crevelle, and pompano will be the primary catches, but sheepshead, grouper, flounder, and bluefish will also be found in the deep water. As the tide rises and the day warms up, fish will move out of the deep channel and up onto the flats to feed. A late Afternoon high tide can offer great fishing for speckled trout, with Cotee jigs and live shrimp under a popping cork are producing the best bites. The flats south of Spanish Point are very productive, but any fl at in four to six feet of water with grass will hold fish, keep moving until you find them. Creeks and residential canals are great spots to fish this month. Besides offering protection from harsh winds, they provide cover for bait, which attracts fish, and the water is normally a few degrees warmer. A large hand picked shrimp is a great bait for redfish, snook, sheepshead, drum, and jacks. Deeper water is the key, find a dock or area in a creek with a little more depth and there should be fish there. A few pieces of shrimp tossed out as chum can help get the bite going. Rapala X-Raps are a terrific artificial bait to use in creeks. They are deadly on snook and jacks, and a lot of water can be covered quickly. Go with smaller lures this time of year to imitate the bait that is present. Oyster bars are abundant in this area and are fish magnets. Small crabs and worms will hide in the crevices, and this attracts game fish, especially redfish and sheepshead. A 1/8 ounce jig tipped with a tiny piece of shrimp is a deadly bait to use when fishing the bars. Scented soft plastics like Trigger –X and Gulp baits also work very well. I like darker, natural colors such as olive, rootbeer, and smoke. Fish them as slowly as possible without snagging on the bottom. Of course, a live shrimp will also catch plenty of fish. A float may be required to keep the shrimp from hanging up in the oysters. Sheepshead will be around in good numbers by the end of the month. Unlike most species, these tasty saltwater panfish do not mind the dirty water. Structure in the passes, bridges, docks, and oyster bars throughout the area may hold sheepies. Shrimp are an effective bait and are easily obtained. Live shrimp are best, but frozen shrimp will catch fish, too. Use a #1 live bait hook on 24” of 30 lb leader and enough weight to hold the bottom. February is the last month of winter here in Sarasota. There will be days when it feels like spring is in the air. But, weather patterns will still be unstable, and fishing will follow suit. Being flexible and understanding how weather affects fish behavior will be the key to angling success this month. On many mornings the tide will be very low, especially with a hard northeast wind following a cold front. Under these conditions, fishing the afternoon high tide is often a better choice. Also avoid the areas near the passes after a blow, the cold and dirty water is not conducive to success. One species that anglers can count on most every trip in February is sheepshead. They bite better in cold, dirty water than most other species do. Also, redfish, black drum, and flounder will be caught on the same structure and using the same techniques that are effective for sheepies. Basically, any structure will attract sheepshead. From the rocks at the west end to the Siesta Drive Bridge on the east side, the north end of Siesta Key is a great area to fish. Deep water, docks, rocks, seawalls, and rip-rap will attract and hold fish. All of the bridges and docks in both Big Pass and New Pass may hold fish, as well as the docks and oyster bars south to Albee Rd. The preferred rig is a #1 live bait hook with a 24” piece of 20 lb leader and just enough weight to hold bottom. Live and frozen shrimp, fiddler crabs, sand fleas, and oyster worms are the top baits. Shrimp are the easiest bait to obtain and work great. Sheepshead bite very lightly. Usually, it starts with several light “taps”. It is important not to move the bait at all, the fish will sense that something is wrong. Instead, wait for a steady pull, then reel fast and raise the rod tip sharply. Casting jigs while drifting with the tide in the passes will be productive when the water is clear. A ¼ oz Cotee jig head with a gold grub tail is a very effective bait. Pompano, bluefish, ladyfish, and maybe an early-arriving Spanish mackerel will be the primary catches. Try the shallow bars and the deeper channels, keep moving until the fish are located, then concentrate drifts on that area. The deeper grass flats all throughout the area will be productive for speckled trout this month. Incoming tides a couple hours before high tide are usually the best times to fish. Again, avoid the areas around the passes when dirty water is present. The area further south, from CB’s Saltwater Outfitters at Stickney Pt. to Marker #19 in Nokomis, stays protected, resulting in reliable February fishing. Cotee jigs, Rapala suspending plugs, gold spoons, and live shrimp under a popping cork are all effective baits. Pompano, jack crevelle, ladyfish, and bluefish all feed over the deep grass. Siesta Key fishing forecast. 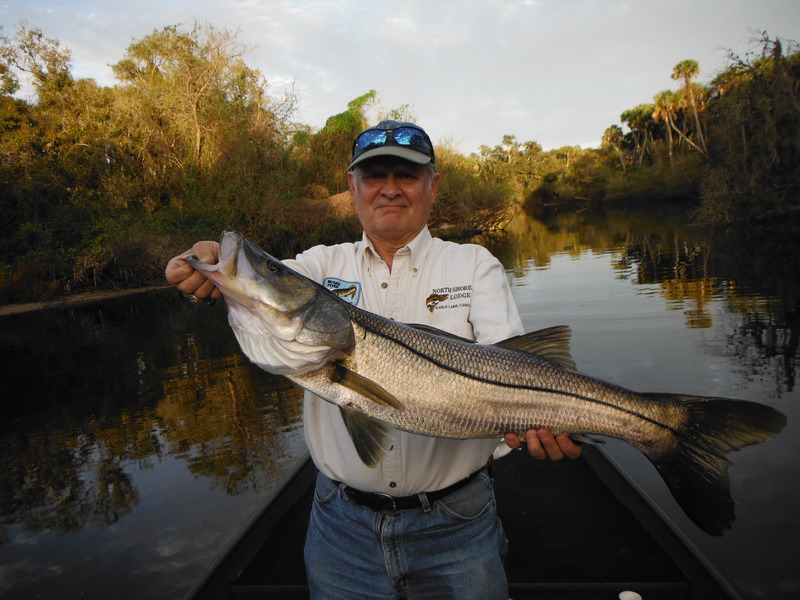 Snook will be found in creeks and residential canals, along with redfish, drum, flounder, sheepshead, and jacks. Rapala X-Raps, scented soft plastics, and live shrimp will all produce fished near structure in creeks and canals. A slow presentation will be more productive in the cooler water. Extreme low tides offer opportunities for anglers who enjoy sight fishing for redfish. The area on the east side, north of Long Bar is very shallow with many small potholes, resulting in idea conditions to find tailing reds. The flats off of the Ringling Mansion and Buttonwood Harbor are also good spots to fish. Scented soft plastic baits, weedless gold spoons, and live shrimp are the preferred baits. Siesta Key fishing forecast. March is a great month to fish in Sarasota. It is the first month of spring, both on the calendar and outside. 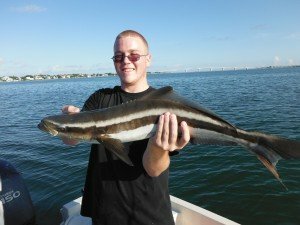 The list of available species is long; snook, redfish, trout, pompano, cobia, king and Spanish mackerel, sheepshead, flounder, snapper, grouper, jack crevelle, and sharks just to name a few. Big Pass and New Pass will be very productive this month, particularly when the water is clean. Often times the tide is low in the morning, making the passes a great place to start off a trip and bend some rods. Ladyfish are usually thick, with bluefish, mackerel, and pompano mixed in. Live bait will work, but this is a great situation to cast artificial lures. Fish in the passes are usually actively feeding and can be seen busting baits on the surface. Gold Cotee grubs on a ¼ ounce jig head and (08) Rapala X-Raps are two effective lures. The sheepshead run will peak this month. Just about any structure near either pass will hold these tasty critters. A live shrimp fished on the bottom should result in a fish dinner pretty easily. Speckled trout will be schooled up over deep grass flats throughout the entire area. Incoming tides are best, but as long as the water is moving the fish will bite. A live shrimp under a noisy cork is a proven trout slayer. Jigs, spoons, and plugs will fool many fish, too. Pompano, mackerel, ladyfish, bluefish, jacks, and a stray cobia will also be encountered when fishing over the grass flats. These are large areas, the key to success is to keep moving until fish are located, do not spend too much time in one spot if it is not producing. 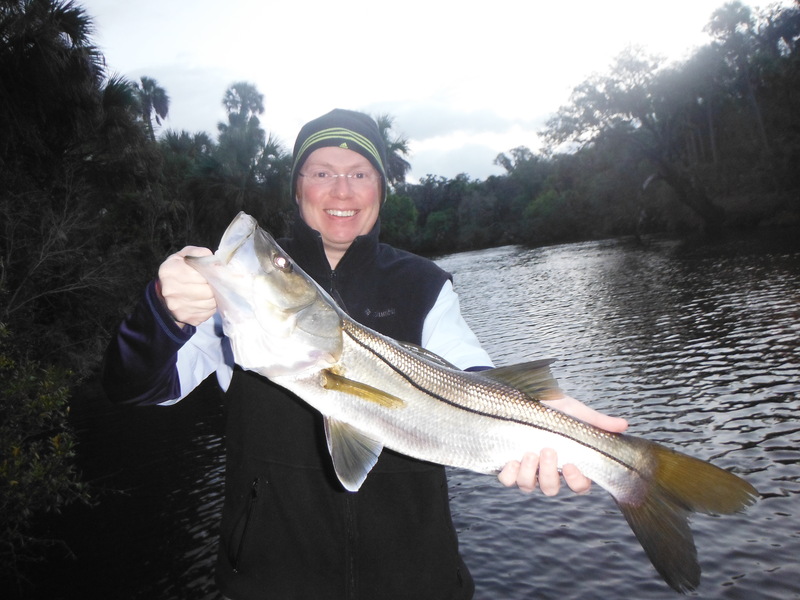 Snook will move out of their winter retreats on their way out to the Gulf to spawn. Any structure with a depth change is a likely place to catch a snook. Docks, bridges, and oyster bars are all very productive, especially those with some current. Plugs and scented soft plastic baits are the top choices, along with a large hand-picked shrimp. Fishing the area bridges at night is a great way to catch a bunch of snook. Free-lined live shrimp, artificial shrimp and plugs work well. Fly fisherman will score using any small white baitfish pattern. Remember, snook season is closed, handle the fish with care and release them unharmed. 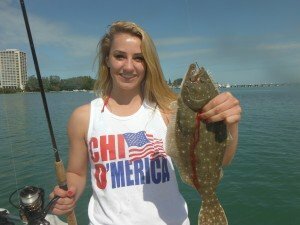 Anglers who prefer to sight fish in very shallow water will do well working the expansive flats up in north Sarasota Bay from the Moorings north to Longboat Pass on the west side and Ringling north to Tidy Island on the east side. The flat north of Long Bar is a top spot; lush grass and numerous potholes attract the fish. Reds, snook, and large trout will hide in the potholes. Gulp! Shrimp and soft plastic baits on a 1/8 ounce jig head worked slowly through the holes will entice strikes. Weedless gold spoons are a great bait to use when prospecting or when the fish are scattered, anglers can cover a lot of water quickly with these lures. The beach should come alive this month, provided the winds cooperate. Spanish and king mackerel will invade the area, along with cobia, sharks, and false albacore. The inshore reefs off of Lido Key are a great place to start, they hold a lot of fish. Trolling spoons and plugs is a deadly technique and will fill the cooler in short order. For more sport, look for breaking fish on the surface and cast plugs, spoons, or flies out into the frenzy, a vicious strike should occur immediately! Siesta Key fishing forecast. Big Pass and New Pass will be alive with fish migrating in and out of the bay this month. Spanish mackerel, bluefish, pompano, and ladyfish should be plentiful. Pompano prefer a small white or chartreuse jig bounced along the bottom while the mackerel are often found higher in the water column or breaking on the surface. There is nothing more exciting than casting a surface plug on light tackle or a fly into a feeding frenzy! Action on the deep flats will be very good for speckled trout, pompano, Spanish mackerel, bluefish, and ladyfish. The best flats to fish will be from Siesta Drive north to Long Bar. Flats that are near both passes will be especially productive. A ¼ ounce Cotee jig in gold, olive, or rootbeer is a great lure to prospect with; a lot of water can be covered and just about every species will hit it. Rapala X-Raps work very well when surface activity is seen, they also are a great lure to troll slowly and locate schools of fish. Silver and gold spoons are another good choice. Live bait works very well, too. There should be plenty of whitebait to net up and of course a live shrimp free lined or fished under a noisy float is a deadly technique. Shallow water anglers will do well targeting the flats up north of Long Bar on the east side and north of the Moorings on the west side. A low, incoming tide is preferred, flood tides make locating fish more difficult. Weedless gold spoons, scented soft plastics, and topwater plugs also work well in shallow water. Expect to find snook, redfish, and large gator trout in the holes. The area between Siesta Drive and Blackburn Point will be good for snook as they migrate out towards the beach to spawn. Any point, oyster bar, dock, or creek mouth that drops off into deeper water is a likely spot to try. High, outgoing tides are best. Plugs cover a lot of water and result in vicious strikes while jigs require more patience but will fool more redfish along with snook. Don’t be surprised when a big jack crevelle or trout inhales an offering meant for a snook or red. This has been a fantastic season for sheepshead and while it is past its peak there should still be plenty of these tasty saltwater panfish around. Docks, seawalls, and bridges near passes will hold sheepies. A live shrimp fished on the bottom will fool them, along with snapper, grouper, and flounder. April is a great month for anglers with a small boat and not a lot of experience to catch big fish. The beaches and inshore artificial reefs will be thick with king and Spanish mackerel, along with false albacore and the occasional cobia. Trolling spoons is very easy and deadly on all species. Use a planer and 20 feet of leader. With a #1 planer use 50 lb leader and a small Clark spoon and with a #2 planer use 80 lb leader and a large King spoon. Idle the boat along at 4 to 5 knots, let the #1 planer out 20 seconds and the #2 out 12 seconds. Then, just drive around until you find the fish. When surface activity is spotted, break out the light spinners or fly rod and experience some great sport! Siesta Key fishing forecast. May is a transition month in Sarasota. Although the calendar says it is still spring, by late May it will definitely feel like summer time. Pelagic species such as king and Spanish mackerel will have migrated north, inshore fishing will be best early and late, and giant tarpon will invade the inshore Gulf of Mexico, a sure sign that summer is here! Speckled trout fishing should be outstanding in May. It has been unseasonably warm and bait will be scattered all throughout the bay. The flats from Big Pass north to Long Bar have traditionally been the most productive. High tides in the morning are prime times to fish the deep flats at Bird Key, the radio tower, middlegrounds, Stephen’s Pt, Moorings, Bishop’s Pt., and Buttonwood. Casting gold, olive, and rootbeer/gold Cotee jigs in front of a drifting boat will produce a lot of speckled trout. A live shrimp under a noisy cork is a deadly technique for catching trout. Pinfish, grunts, and pilchards will produce less fish, but generally larger ones. The shallow flats will be very active as they flood with bait. The large area north of Long Bar is full of pot holes and lush grass. On the west side, the prime spots begin at Country Club Shores and go north to Longboat Pass. A low, incoming tide is the best time to search for reds and snook in the skinny water. Fish will stage in holes and deeper water then move up onto the shallow flats as the tide floods. Scented soft plastics, weedless gold spoons, topwater plugs, and live bait are all effective. Lures work best when looking for fish, water can be covered quickly. Live bait is best once the fish are located. Some of the largest trout will also be found in shallow water. Snook will be moving out to the beaches and will be scattered out all over. Mangrove points and bars near the passes should hold snook, as will structure in both Big Pass and New Pass. Outgoing tides are preferred, but as long as the water is moving, fish can be caught. Rapala X-Raps and other plugs are great baits that cover a lot of water quickly and are great fun to fish. Jigs and other soft plastics work well, too. Anglers who are proficient with a cast net will load up the well with pilchards and catch a lot of fish. By the middle of the month, many guides and recreational anglers will be focusing on one of the most exciting angling challenges found anywhere, light tackle casting to giant tarpon! This is truly world class big game fishing. Tarpon that migrate up our coasts are large fish that average 80 pounds, but reach over 200 pounds. Anglers will get out on the beach very early, just before the sun rises, and set up a hundred yards offshore. Once it becomes light enough to see, tarpon fisherman become hunters, searching the water for signs of fish. In May, the schools are usually large and easy to see. Once sighted, an electric trolling motor is used to position the boat in front of the approaching pod of tarpon. Stealth and patience are required, noisy outboards will spook the fish. 25-30 lb spinning tackle and 12 weight fly rods are used most often. A live crab is the preferred bait, but live pinfish and other bait fish work well, too. These baits are fairly light and spinning tackle works best to cast and present baits. Siesta Key fishing forecast. Beach fishing for snook was fabulous last season, and it should be good again this summer, especially with the mild winter that we had. Walk the beach in the morning, looking for snook in the surf line. Cast out a small spoon, plug, or jig in front of any snook that you spot. This is a great time to break out the fly rod, white baitfish patterns are best. Siesta Key fishing forecast. Tarpon will still be plentiful in the Gulf of Mexico, although the anglers will not be. The large schools will have broken up, and although the fish don’t show as well, they eat better. Pinfish and crabs drifted out 6 feet under a cork at first light will catch tarpon in July. Point of Rocks on Siesta Key is a proven spot to fish. Siesta Key fishing forecast. There is a little secret here in Sarasota; the fishing is terrific in August! Many anglers assume that the heat slows down the action, but this is far from true. The reality is that due to daily rain showers, the water temperature is actually lower in August than it is in June. Hordes of bait fish cover the flats. This combination results in excellent conditions for anglers to succeed. The best action will be early morning, late afternoon, and at night. Snook love the infusion of fresh water into the bay. Phillippi Creek, South Creek, Hudson Bayou, Big Pass, New Pass and the Venice inlet are all good spots to cast a plug in search of snook as they migrate back into the bays after spawning out on the beach. Shallow diving plugs such as the Rapala X-Rap are very effective baits. They cover a lot of water and produce explosive strikes. Scented soft plastics also work well. Live shrimp, pinfish, and pilchards will also catch a lot of snook, particularly once the fish are located. Outgoing tides at first light and in the evening are the best times to fish. Redfish will begin to school up in large numbers in August. Traditionally, the best spots are the expansive flats in north Sarasota Bay. Long Bar north to Tidy Island on the east side and the Moorings north to Sister Keys on the west are great area to look for schooling reds in August. The bars south of Siesta Drive are also worth a try. Weedless gold spoons and scented soft plastic baits on a 1/8 ounce jig head are proven baits. Hand-picked shrimp cast into pot holes is a deadly technique, too. Low, incoming tides are best. The deep grass flats at Marina Jack, Bird Key, Radio Tower, Moorings, Bishop’s Pt., Buttonwood, and Stephen’s Pt. will be good spots to target speckled trout. High tides in the morning will produce plenty of fish. 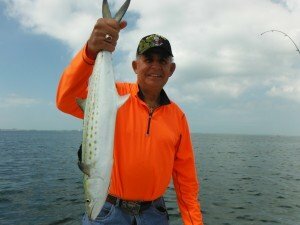 Spanish mackerel, pompano, bluefish, ladyfish, jack crevelle, sharks, small gag grouper, and mangrove snapper will also be caught by anglers drifting the deep grass. A live shrimp under a popping cork works very well. A jig with a grub tail is the preferred artificial bait but plugs and spoons are also effective. The bars form CB’s Saltwater Outfitters at Stickney Pt. south to Blackburn Pt. will hold some very nice trout. This area does not get a lot of pressure in the summertime. This is an early morning bite and a high tide is preferred. Any oyster bar that drops off sharply from shallow water into four or five feet with grass is a likely spot. Live shrimp work very well either free lined or under a cork. Rootbeer/gold and olive/red Cotee jigs are productive lures to cast. Redfish and snook will also take a bait that is intended for a big speckled trout. In the last several years mangrove snapper fishing has been outstanding! Grass flats that drop off into deep water with some current flow should produce plenty of nice snapper this month. Live bait works best and baitfish will usually catch larger fish than shrimp. A 1/0 live bait hook tied on a 24” piece of 20 pound flourocarbon leader with just enough split shot to get to the bottom is the simple but effective rig. Tarpon will still be an option in the inshore Gulf, but their numbers will be diminishing and they will not be “showing” like they do earlier in the season. Live pinfish floated out under a cork at Point of Rocks will still produce a fish or two. September is the month that redfish begin schooling up in Sarasota. The expansive shallow flats in north Sarasota Bay are traditionally the most productive areas to fish. Long Bar is a great place to start searching for fish. A low, incoming tide in the morning is preferred, allowing anglers to see the large schools of reds. As the tide rises, the fish will work up from the edges of flats and holes onto the grass to feed. Locating the fish can be difficult under flood tide conditions; there is just too much water up on the flat to effectively sight fish. Artificial baits that work shallow and don’t get hung up in the grass are the most effective baits. This includes soft plastics on a light jig head, weedless spoons, and topwater plugs. A gold Johnson weedless spoon is a proven lure. It can be cast a long way and covers a lot of water. Scented soft plastics such as Trigger-X and Gulp! Baits are extremely effective, particularly once fish are located. They allow anglers to work an area slowly and thoroughly. Special weighted hooks are made specifically for this application, but a 1/8 ounce jig head also works well. Large live shrimp and bait fish will also produce; however live bait can be difficult to fish in shallow grass. Speckled trout fishing has been outstanding this year and this should continue in September. Deeper flats will produce more fish, while the larger specimens may be found in shallow water. A Rapala Skitter Walk or X-Rap worked over bars at first light is a deadly technique for fooling gator trout. Along with trout, anglers fishing the deep grass will catch a variety of species this month including bluefish, Spanish mackerel, mangrove snapper, pompano, gag grouper, and ladyfish. Both live bait and artificial lures will catch plenty of fish. A gold Cotee grub on a ¼ ounce jig head is a great choice for anglers who enjoy casting artificial lures. Olive (08) X-Raps and other plugs are also effective along with gold and silver spoons. A live shrimp under a popping cork is a time-proven technique for catching “specks” on the West Coast of Florida. We experienced a fantastic late summer tarpon frenzy the last several years off of Buttonwood Harbor. Giant tarpon will terrorize schools of glass minnows and ladyfish early in the morning. Live ladyfish and pinfish drifted behind a boat will produce strikes, as will large plugs cast to rolling tarpon. Snook will migrate from the beaches back into the bays. Both passes will be great spots to fish, especially on afternoon outgoing tides. The bars and mangrove shorelines along Siesta Key are prime spots as the fish move towards their fall feeding areas. Artificial baits will allow anglers to cover more water, while a well full of pilchards practically guarantees success. Redfish, large speckled trout, jack crevalle, and mangrove snapper may also be encountered while pursuing the mighty snook. Lighted docks and bridges are snook magnets and will provide great action for anglers looking to catch fish and escape the summer sun. Live and artificial shrimp free lined in the tide are deadly, as are small white flies. The rocks and bridges in both New Pass and Big Pass will be excellent spots to target mangrove snapper this month. These tasty saltwater panfish will be migrating out of the bay and into the Gulf of Mexico. Slack tides are the best times to drop a live shrimp or bait fish along the structure. Don’t be surprised if a big snook intercepts a bait meant for a mang! October is a fabulous month to be fishing in Sarasota! Shorter, cooler days result in water temperatures dropping into the low 70s, bait will be thick in the bays and out on the beach, and that will attract the gamefish. Many species are going to be caught using a variety of angling tactics. 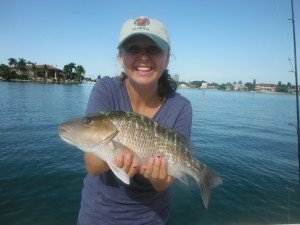 Redfish will still be schooled up on the flats in the north bay, snook will be in the bays, speckled trout, pompano, and Spanish mackerel will be feeding on the deep grass flats, and the beach should be outstanding for king and Spanish mackerel, false albacore, cobia, sharks, and even a stray tarpon. Anglers with small boats can catch large fish this month. The techniques and methods are really pretty simple. Mornings that dawn with easterly winds will find the inshore Gulf of Mexico flat and calm. Pods of baitfish will be seen on the surface, along with schools of feeding fish. Threadfins caught on Sabiki rigs and free lined out behind the boat will catch just about everything. Use a 4/0 hook on a 24” piece of 80 lb leader and drift the bait on the outer edges of the bait pods. If cutoffs from kings or sharks become a problem, use a short piece of wire. Shrimp and smaller baitfish work well on the Spanish mackerel and albies, use a 2/0 long shank hook on 40 ln leader. There is no greater sport than sight fishing “breaking” fish. Actively working gamefish will hit spoons, Rapala X-Raps, jigs, and flies. Silver and white are good colors to start out with. Often times, small baits will be needed, especially for the false albacore, they can be quite fussy. Patient anglers will score more often than those driving aggressively into the fish. Getting in the area and just sitting patiently while waiting for an opportunity will produce more fish than “running and gunning”. If the fish are not showing well or if there is a chop on the surface, trolling Rapalas and Clark spoons on planers can be deadly. The inshore artificial reefs are fish magnets and success is practically guaranteed for trollers in October. Casting jigs while drifting over deep grass flats will produce a lot of fish in October. Speckled trout, pompano, bluefish, mackerel, jacks, and ladyfish will hit a gold Cotee grub on a ¼ ounce jig head. Rootbeer and olive are also productive colors. Spoons, plugs, and flies will also work well, as will live or artificial shrimp under a noisy cork. These same lures fished in Big Pass and New Pass will result in plenty of hook-ups as the fish migrate from the Gulf into Sarasota Bay. Fish right on the bottom for pompano and just under the surface for blues and macks. Redfish will still be schooled up, but their numbers will be diminishing. The shallow flats in the north bay near Long Bar and Buttonwood Harbor are great spots to try. The docks and oyster bars off of Siesta Key will also produce redfish, along with snook, snapper, flounder, and drum. A live shrimp is a a great bait for fishing docks, scented soft plastics such as Trigger-X baits are very effective working bars and points. A high, outgoing tide is best. 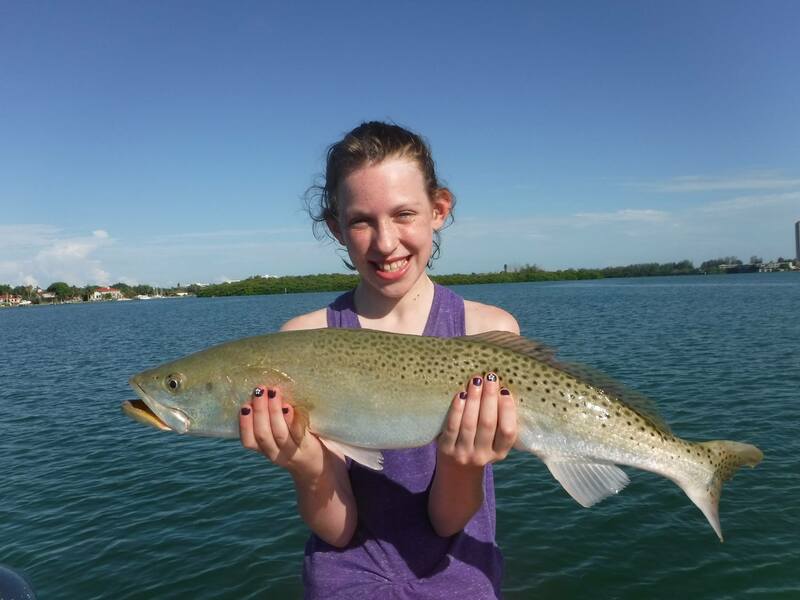 November offers Sarasota anglers diverse opportunities. A wide variety of species are available this month, and multiple techniques will be successful. The key is adapting to the conditions; weather will become a factor at times. Water temperatures will be falling as it cools off and the days become shorter, and this will trigger fish to feed. Both Big Pass and New Pass will be productive spots to fish this month. Pompano will be targeted by many anglers, along with Spanish mackerel, bluefish, and ladyfish. Drifting with the tide and bouncing a jig off the bottom is a proven technique to catch pompano and other species. Yellow, white, and chartreuse pompano jigs work very well in deep, swift water. These jigs are small and compact, allowing them to sink quickly. These same jigs are effective in shallow water and on bars when cast out and retrieved back to the boat using short hops. Spoons and Rapala plugs are very effective when breaking fish are seen working in the passes. Pompano will also be taken on the deep grass flats, as will speckled trout, bluefish, mackerel, jack crevalle and other species. Scented soft plastics such as Trigger-X baits on a ¼ ounce jig head are extremely productive and a lot of fun to fish. A live shrimp either free lined or fished under a cork is the top choice for anglers who prefer live bait. Fish will begin moving south from the passes to the flats between Stickney Pt. and Blackburn Pt. and will be scattered over a large area. Successful anglers will fish quickly until the fish are located. Redfish schools will be thinning out in the shallow water, but there will still be plenty of fish in the pot holes, along mangrove shorelines, and around oyster bars. Rapala plugs, weedless gold spoons, and jigs are all excellent choices for probing the shallow flats. These same lures will also catch snook, along with speckled trout and jack crevalle. Snook will be migrating through these areas on their way to their winter haunts and will be feeding heavily. Points, bars, and docks with current are prime ambush spots for game fish. Large live shrimp are deadly when fished under docks, although it will not allow anglers to cover nearly as much water. Night fishing under lighted docks and bridges will also produce a lot of snook this month. King mackerel, Spanish mackerel, false albacore, cobia, and sharks will bend rods and test drags in the inshore Gulf of Mexico, provided the severe fronts stay away. Point of Rocks on Siesta Key is a prime fall spot to either sight cast to breaking fish or troll plugs and spoons. Live bait will also produce, especially once fish are located. Live blue runners and threadfins slow trolled on a “stinger” rig will catch some very nice kings along with sharks. Drifting a live shrimp or small bait fish will catch plenty of Spanish and albies. Casting lures and flies to breaking fish on light tackle is tremendous sport! This is great fun and really relatively uncomplicated. Rig a light spinning outfit with a two foot piece of 30 lb fluorocarbon and tie on a silver spoon, jig with a shad tail, or a plug. Ease into casting range as quietly as possible and you are in business. In most instances an aggressive retrieve will trigger a bite. Fly anglers will do well with an 8 or 9 weight rod and a floating or intermediate sink tip line. Small, white flies work well; either a Glass Minnow or D.T. Special are the most popular. December is a month that will test an angler’s ability to adapt to current conditions. Water quality will vary throughout the area as passing cold fronts churn up the Gulf of Mexico. The flats between Stickney Pt. and Blackburn Pt. will be more productive under these circumstances. After several days of nice weather, the water near the passes will clear and those areas will once again be good spots to fish. Creeks and canals will attract fish as water temperatures drop. Often times the tides will be very low in the morning in December. This will move trout, pompano, and other species off of the flats and into the deeper channels. There simply is not enough water up on the flat for them to be comfortable. Bouncing a jig down the sides of channel edges can be very productive. As the tide rises, fish will move up onto the flats to feed. Afternoon high tides can be the best time to fish the deep flats this time of year. A live shrimp under a cork is very effective, as are jigs with plastic grub tails. Natural colors such as olive, rootbeer, and motor oil work well in the slightly darker water. Oyster bars south of Siesta Drive will hold redfish, snook, and trout, along with the first of the migrating sheepshead. Bars that drop off sharply into deeper water will be the most productive spots. Free lined live shrimp and scented soft plastics on a 1/8 ounce jig head work well. Docks, canals, and creeks in this same area will also hold fish, especially after fronts; the water will be warmer and cleaner in these areas. On cold mornings the very back of a canal will have the warmest and may concentrate fish. There are several creeks and countless canals in our area, and all of them are productive winter time spots. Hudson Bayou, Whittaker Bayou, Bowles Creek, Phillippi Creek, South Creek, and the Grand Canal on Siesta Key are some of the most popular fishing holes. Rapala X-Raps work very well on snook and jack crevelle for anglers who prefer to cast artificial baits. They elicit explosive strikes and allow anglers to cover a lot of area fairly quickly. Once fish are located, large live shrimp and slowly worked soft plastic baits will also catch their share. 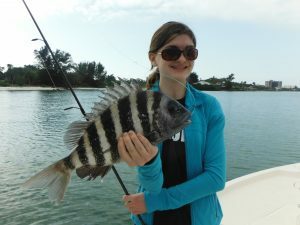 Sheepshead and black drum will be found in the deeper holes, a live shrimp works best for these tasty bottom dwellers. 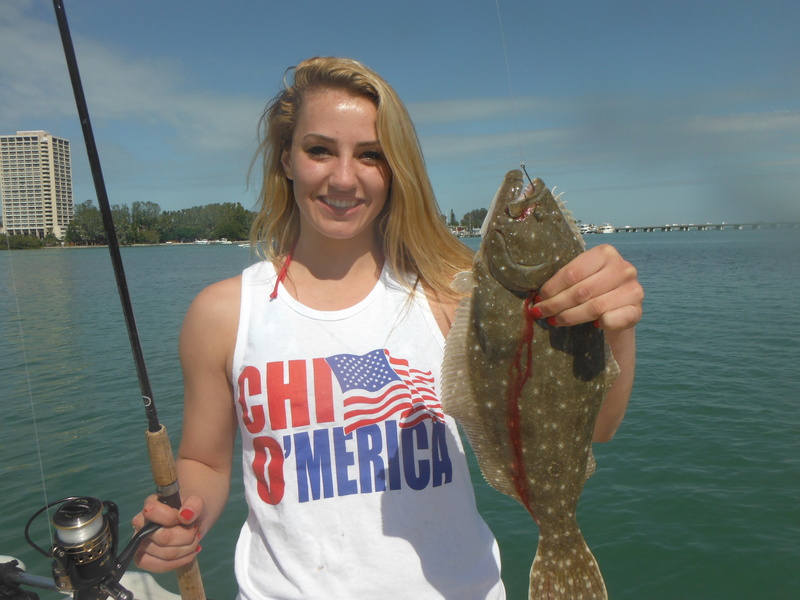 Flounder seem to be plentiful this year and should also be caught in these areas. Both Big Pass and New Pass will be good spots to fish when the water is clean, especially on the morning incoming tide. Jigs bounced off the bottom will catch pompano, bluefish, Spanish mackerel, and ladyfish. Keep moving until fish are located, then concentrate on that area making short drifts and motoring back around up-tide and drifting through again. Structure in both passes will attract sheepshead, along with grouper, snapper, flounder, and other species. Slack tides are the best times to fish these spots, a swiftly moving tide makes getting the bait to the bottom difficult. The many docks along Bird Key are especially productive for sheepies. If the weather cooperates, Spanish mackerel and false albacore (bonita) should still be off of our beaches. Schools of game fish will be seen ravaging helpless bait fish on the surface. Silver spoons, plugs, and jigs cast into the melee’ will all produce explosive strikes. This is a great opportunity to fly fishermen to experience some world-class fishing. A false albacore on a 9 weight rod is terrific sport!